The Parks Committee on the 21st July 1891 noted that Grangetown had no open recreational spaces at all, and it was agreed that the ground-lord (Lord Windsor) be approached to apply for suitable land. On the 20th October 1891 the Committee received a report that talks were in progress with Lord Windsor and with Lord Bute, who also owned land in the area. The proposed plot totalled 3 acres, of which 9,043 square yards belonged to Lord Bute and 5,764 square yards to Lord Windsor. Both agreed to donate the requested portion of land and on the 15th March 1892 the Parks Committee recorded its thanks to both landowners for their gifts. In February 1892 the Parks Committee received an estimate of the cost of laying out the ground amounting to £2,500, and the Committee agreed to borrow that sum. The name Grange Gardens was approved in March 1892. An agreement with the Health Committee for levelling the site with "scavenging material" was reached, but it was more than a year before any work was carried out. Significant opposition to the proposal to tip rubbish on to the site was expressed at the Council meeting on 13th February 1893. A public meeting of ratepayers in January pressed for progress to be made, and the Council instructed the Parks Committee to proceed with construction of the surrounding roads and planning the garden. On the 21st February at the Parks Committee meeting, the Borough Engineer recommended depositing "surplus material" from the western side of the Taff embankment, taking note of the concerns of the Grangetown residents and therefore exercising due care with the selection of material. This was approved, and when work began there was no further opposition. By June 1893 sufficient progress had been made for the Engineer to seek approval for the detailed plans and estimates for the garden and walkways. Fencing was erected during 1894. The Borough Engineer's report of the 17th September 1894 referred to the preparation of beds for shrubs, while on the 7th January 1895 he reported that all turf had been laid and work on footpaths was in progress. In November 1894 the Parks Committee approved plans for a bandstand, which in the event was the first to be built in any Cardiff park. By this time a uniformed caretaker had been appointed and a caretaker's shelter erected. This shelter is still present (2017). The opening ceremony for Grange Gardens, performed by Councillor Ramsdale, the Deputy Chairman of the Parks Committee, took place on 19th June 1895. While tennis courts and bowling green were provided, the limited space precluded the provision of cricket and football pitches and prompted a search for additional space for a recreation ground in Grangetown. In 1905 it was agreed that the Council would lease from the Windsor Estate a nearby plot of land known as the Marl. 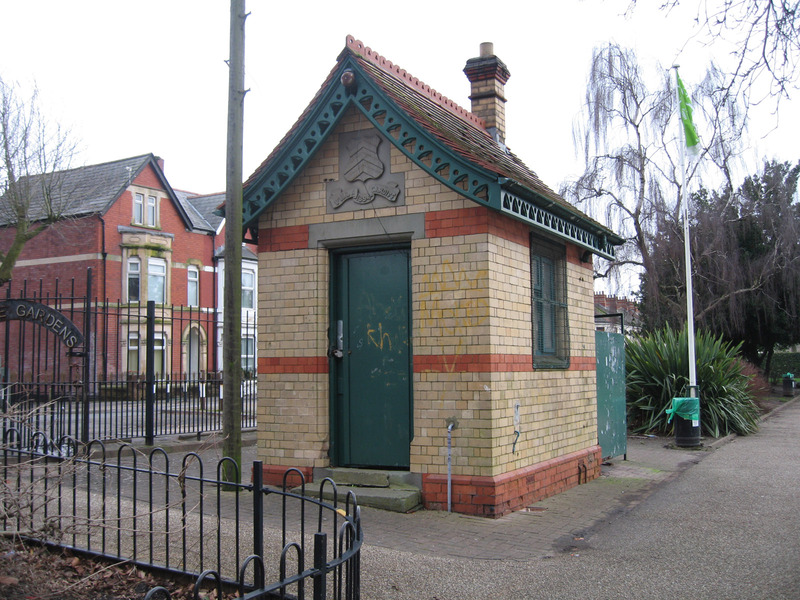 In January 1910 it was agreed that a small shelter be built in Grange Gardens at a cost not to exceed £20. During the 1939-45 war there were ARP (Air Raid Precautions) Wardens based in Grange Gardens, occupying the bowls pavilion. There was also an emergency water supply for fire fighting, a static water supply basin, completed in March 1942, which the Parks Committee considered to be a danger to children in the absence of adequate fencing. Aerial pictures from 1942 suggest it occupied the section of the Gardens bordering Pentrebane Street and Corporation Road. It had four unequal sides, was roughly the size of a bowling green and sat between the paths radiating from the centre of the Gardens. By May 1946 this had been removed: the Director of Parks reported to the Parks Committee that all emergency water supply basins had been removed and he had made a claim for restoration of the sites to their original condition. In 2000 a lottery-funded redevelopment was carried out, involving replicas of the bandstand and drinking fountain canopy as well as new entrance gates, railings, paths and shrub and tree planting. In general, the information in this section is taken from A. A. Pettigrew, The Public Parks and Recreation Grounds of Cardiff, Volume 2, chapter on Grange Gardens.